Ted says a set of high-quality stones will make a great trigger job all that much easier! One of the most important tools in anyone’s shop isn’t a machine, vise or file. It is however, one of the most versatile tools at our disposal, performing a wide range of tasks with precision, offering predictable and repeatable efficiency. What’s this miracle gadget, and why’s it so important? Simple answer — it’s the abrasive stone, and it comes in as many variations and materials as there are applications for it on the gunsmith’s bench. Most of us think about stones for doing trigger work, and they certainly excel in this role. 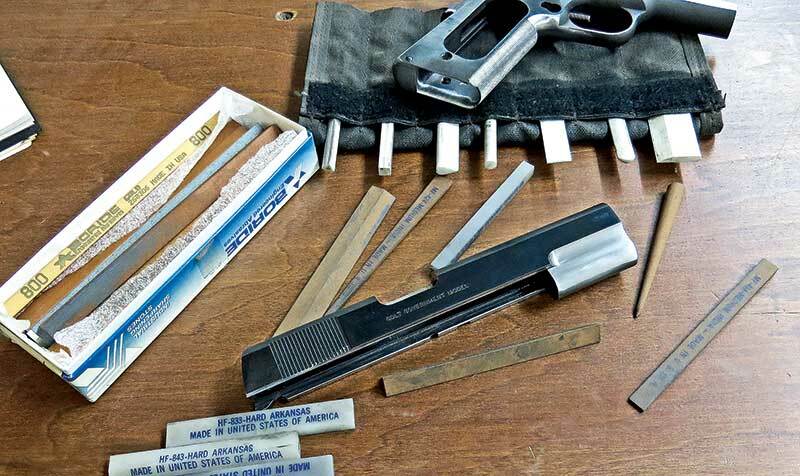 No serious hobbyist’s bench should be without a set of 1/2″ square stones — either India, ceramic or Arkansas — as they’re the cornerstone (pardon the pun) of trigger work for a myriad of guns. Used with a proper fixture, a good square stone lets us true up and smooth engagement surfaces resulting in a safe, reliable and precise trigger pull. Used properly, with an India or Arkansas stone to do the cutting, a ceramic stone to do the light squaring and polishing, what results are perfectly smooth, drag-free surfaces. As a final step, I even use a fine ruby stone which gives a mirror-smooth surface. For trigger work, look no farther than Brownells for stones with the proper grit, shape and sizes. They’ve done the research for us, and have applications useful with any of the commercial sear/hammer fixtures. I recommend a fine India, and a fine ceramic as a basic set for anyone doing trigger work. For other specific tasks, there are specially sized stones, one for hammer slots, and an indispensable one for 1911 trigger tracks. Stones give you more flexibility, with different shapes and grits making short work of fitting and finishing. Stones have many more uses in the firearms field than just trigger jobs. Equally useful in the parts-fitting and finish preparation areas, shaped stones can be used for a range of operations limited only by your imagination. Stones have a couple of advantages over files for some jobs — the ability to custom-shape the stone to fit the job. Easily accomplished by using abrasive paper mounted on a firm, smooth surface, a stone can be customized to fit the job — especially useful in tight quarters where a file may not fit. I even have small remnants of broken stones J-B welded to makeshift handles to get into tight spots, like the front end of 1911 slide grooves and the innards of revolvers. A stone can remove material without leaving tool marks in the finish. Even the finest files leave cut marks — it’s how they do their job, and why we use progressively finer cuts to remove metal. Replacing the finest file with a stone can save a step in your process as well as leave you with a cleaner finish. I’ve even begun to replace cloth roll abrasive, a staple in my shop, with stones for some clean-up work. I’ve found I can work a stone in closer to an edge or against the end of a checkering pattern without the risk of the cloth abrasive cutting where it shouldn’t or not leaving a crisp edge. Stones also make working up to an edge worry-free. For all their benefits, stones do present some drawbacks. The first is they can be fragile. A file will survive a drop to a hard floor, but a stone usually won’t! A stone can’t just be thrown into a toolbox and left to rattle around — they need to be carefully stored where they won’t impact other hard things. Chipped edges can make it pretty tough to cut nice clean hammer hooks, and can cause a weakness allowing the stone to break if pressure is applied. Stones also require care to operate effectively. Since they’re porous they have to be used with some sort of lubricant. Some makers recommend kerosene, although I don’t much like the smell in the shop. I use a light honing oil and sometimes a synthetic gun oil. This layer of lubrication allows the stone to float over the work piece and cut cleanly and smoothly. The metal particles removed are suspended in the oil rather than embedded in the stone. Letting a stone dry out while using it will cause the metal particles to clog up the pores in the stone, reducing its effectiveness. Keeping your stones clean isn’t hard at all. For ceramic stones, I use a soapy solution of Dawn dishwashing liquid and a toothbrush. Mineral spirits work fine to clean India and Arkansas stones. Be sure to let them air dry thoroughly before putting them away in sealed containers. So, why not round out your bench with a selection of good quality stones? With a little practice, you will quickly learn to love them. Purchase A PDF Download Of The American Handgunner May/June Issue Now!